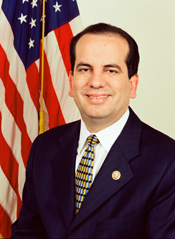 ACEVEDO-VILÁ, Aníbal, a Resident Commissioner from Puerto Rico; born in Hato Rey, P.R., February 13, 1962; B.A., University of Puerto Rico, San Juan, P.R., 1982; J.D., University of Puerto Rico, San Juan, P.R., 1985; L.L.M., Harvard University, Cambridge, Mass., 1987; lawyer, private practice; member of the Puerto Rican house of representatives, 1991-2001; elected as a Popular Democrat to the One Hundred Seventh Congress to a four-year term (January 3, 2001-January 3, 2005); caucused with the Democratic Party; was not a candidate for reelection One Hundred Ninth Congress in 2004, but was a successful candidate for Governor of Puerto Rico; Governor of Puerto Rico, 2005-2009. Aníbal Acevedo-Vilá in Hispanic Americans in Congress, 1822-2012. Prepared under the direction of the Committee on House Administration by the Office of the Historian and the Office of the Clerk, U.S. House of Representatives. Washington: Government Printing Office, 2013.